Activestate seems to have lost its way with Komodo – their scripting language IDE. It used to be a fast, light, and highly usable IDE that made debugging easy. They went off the rails with version 8- it was mostly a UI re-skin with very unstable code, it crashed frequently, froze when opening certain files, and had extremely slow network access. I called it the ‘so what?’ release. They fixed most of these issues in rev 8.5 but the high memory usage still remains. What soured me was paying for a full version upgrade for what was mostly a buggy UI update. Lately, I’ve been getting into Python and I’ve discovered JetBrains’ free Python IDE – PyCharm. JetBrains has a moderately priced paid version but what is amazing is that the free version of PyCharm includes a Python debugger. Compare this to Activestate’s free Komodo Edit which does not include a debugger of any sort. Plus, the paid version of PyCharm includes subscriptions and upgrades for 1 year. Activestate requires you to pay $87 in addition to the price you pay for Komodo for a 1 year subscription. Besides all the price gouging, I’ve found that the free version of PyCharm is a much better Python editor than Komodo. Multiple debug sessions. Want to debug two scripts at the same time? You can do that with PyCharm. Typing in the file window highlights all files that match any of the characters. Komodo only goes to the first match and that is only if you type really fast. Otherwise it will skip around. Dropdowns for everything. PyCharm dropdowns are almost as good as Visual Studio. In PyCharm I can define a variable as a list/string/dictionary and every time after that I’ll get all associated methods when I type in the period after the variable. Importing a module? You’ll get dropdowns for all the module members. Built-in Python package manager, built-in TODO manager, built-in windows cmd console manager (it even lets you have multiple sessions open), and even a built-in repository browser! A little lightbulb (similar to ReSharper) pops up when there is an error or the code can be improved in some way. Clicking on it shows a list of things it can do to fix or improve the code. It makes the changes for you! If you are a Komodo Python user, then try PyCharm. You will be pleasantly surprised. I recently bought some Mighty Plugs Earplugs to help block noisy co-workers at work and to use while traveling. The earplugs are marketed as the ‘highest blocking‘ and ‘most comfortable‘ earplug in the world. They have a sticky putty like consistency which helps them mold to the shape of your ear. This stickiness allows them to attach to your ear without being too invasive. My choice was between purchasing these or the Howard Leight Laser earplugs. I ended up getting the Mighty Plugs because I hadn’t tried them before and they seemed interesting. I’ve been using the Mighty Plugs for six months and so far they’ve been good. They mold to your ears and are good at blocking external sound. However they are expensive, sticky, and get nasty after a while. I’ve decided to go with a pros/cons format instead of my usual review style. Read more below. Mighty Plugs don’t go too far into the ear canal. The earplug molds into your ear cavity and canal to create a full seal. They form a good seal but can come out while sleeping or chewing. The Leight Laser plugs are more invasive and can also come out in similar conditions. 20 year shelf-life (so they say). Leight Laser earplugs will probably last longer due to their synthetic construction. Mighty Plugs last 25-30 uses but they pick-up dust and residue over time which reduces their effectiveness. Leight Laser earplugs last 2-3 uses and you can afford to have a new pair whenever you want. You also are not pushing in old buildup into your ears. Over the long run the Howard Leight earplugs are cheaper, 6 pairs of Mighty Plugs at 30 uses means one pack of 6 can be used 180 times. A box of Howard Leight will last at least 200 uses and you can get a new pair every time. Sticky lanolin leaves a tacky residue on fingers and on ears. Earplus are sticky so they pick up dust, stuff from your fingers, and earwax from your ears. Re-use means you are pushing this stuff into your ears regularly. You also have to ensure you have clean hands before you start or you’ll contaminate the Mighty Plugs for the rest of your uses. Need to knead them for 30-40 seconds before first use and then 15-20 seconds for each subsequent use. Leight Laser earplugs are ready to go in about 2-seconds: squeeze, insert, and hold in place for a moment. Very expensive – 6 pairs for $20 plus $5 for shipping. Leight Laser earplugs are $20 for 200 with free shipping if ordering over $25. Shipping is padded by $1 when ordering from Amazon.com – Mighty Plugs performs a bait and switch to show matching price from their site but then rip off the user via shipping. This is probably done to make up the money they pay to Amazon for their commission since Amazon does not charge commission on shipping charges. This is a decent earplug. However, the tackiness, residue build-up, and expense are major detractions. Their tendency to break their seal is about the same that of regular earplugs coming out. I think they are good for office and other clean environments. They are useless for outside work due to their tendency to pick up dust from the air and your fingers. 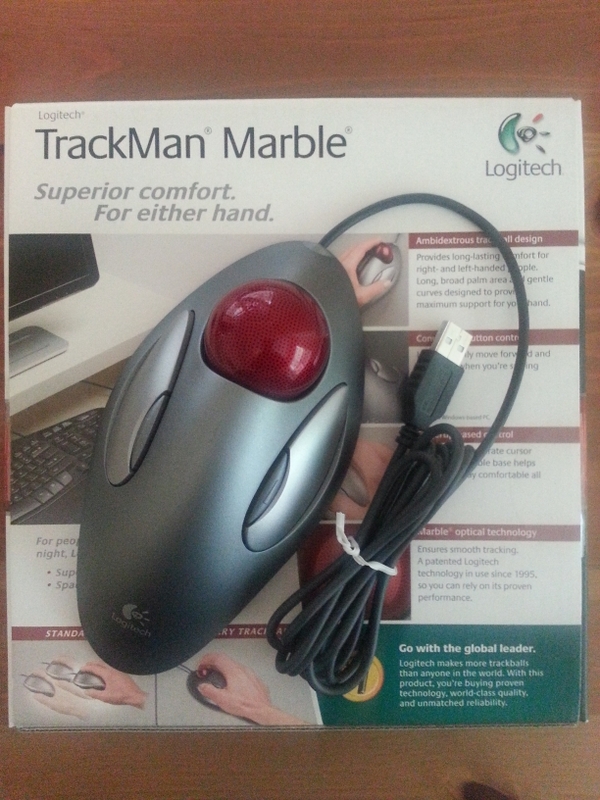 I bought the Logitech Trackman Marble Mouse after finding the Logitech Anywhere Mouse MX to be too small for my long fingers. Excessive use was causing my fingers to cramp up which is not fun after a long day at work. It is too bad because I loved the Anywhere Mouse and found it to one of the best mice I’ve ever used. A co-worker suggested the Trackman because it was ambi-dexterous and it accommodates long fingers. I bought the mouse from Amazon.com for $23. uncomfortably hot with use. 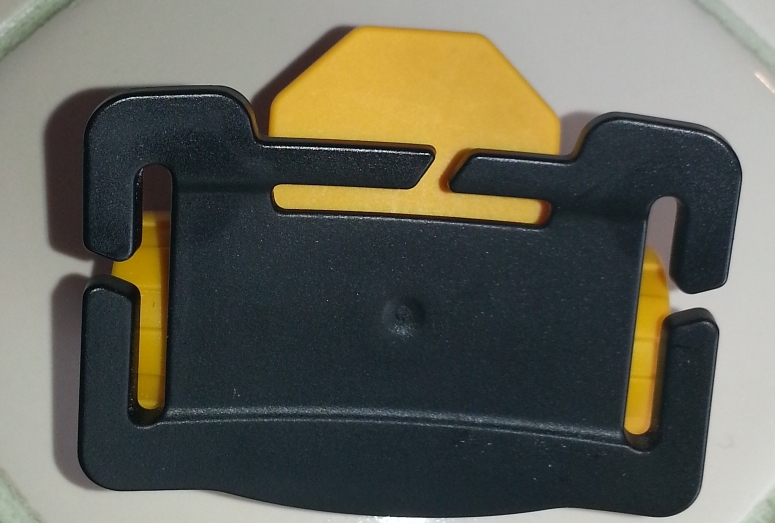 The bottom is the standard mouse black plastic with three anti-slip pads spread around it. The entire unit is sheathed in shades of an unassuming gray that exudes a sense of boredom. 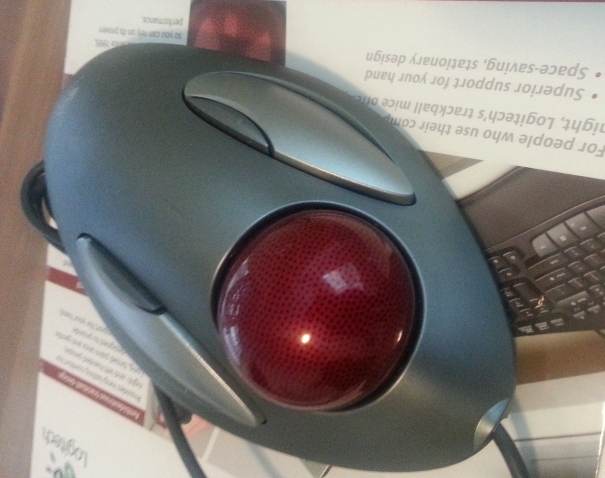 The trackball feels like what you’d expect from a device made from cheap plastic. If feels decently comfortable in my hands, I can rest the palm of my hand on the base and stretch my fingers around it to reach the ball and buttons. The buttons are typical Logitech, the have a linear feel and click with very little drama. Each click is accompanied by a precise ‘snick’ that provides auditory feedback of the action’s execution. I can tell that these buttons are well made and that I can count on them to perform reliably for years. The ball is smooth but is a little heavy and has quite a bit of friction. I have to put in more effort necessary to move it around, I can’t just flip the ball and move the mouse all the way across the screen. The ball is removable and this is a good thing because gunk tends to build up on the supporting pegs. 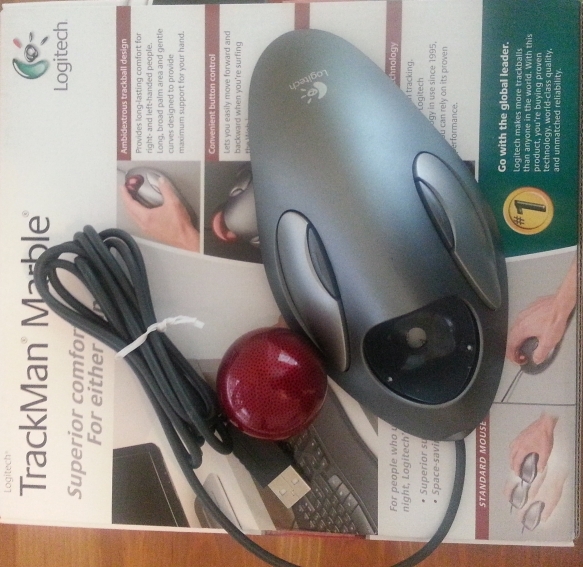 Becoming proficient in using the mouse takes a day or so, precise pointing takes some practice but you can go from opening the box to clicking links in Google in a couple minutes. The main left and right click buttons are easy to find and click. The 2nd set of buttons, meant to be used for back/forward while browsing the web, are useless. Clicking the buttons requires me to contort my hand beyond a comfortable level that is intolerable for any amount of time. The ball is heavy and has a lot if friction. This makes it hard to scroll rapidly across the screen during regular use and I can feel fatigue in my fingers towards the end of the day. A big issue is that gunk from your fingers builds up in the ball supports which further impede progress. I find myself cleaning the ball supports at least once a day. The heavy ball becomes aggravating after a while and I feel like Logitech should have put more work in this part of the design. 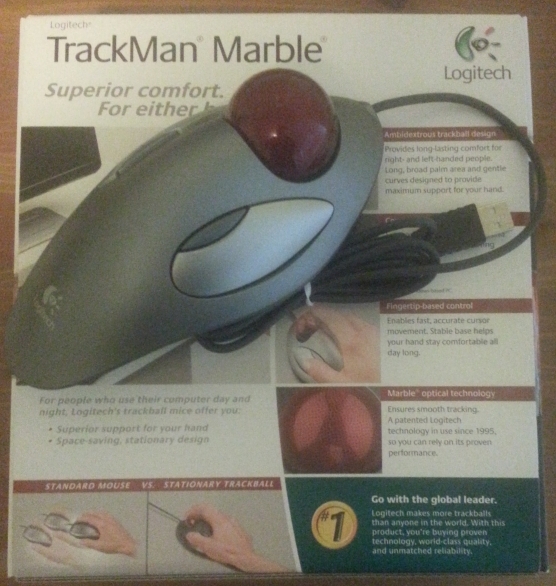 Overall the Trackman Marble Mouse is a decent trackball considering the price. It has no fancy features and it does the work of the equivalent two button mouse. Having a sealed sensor means that the buttons or the ball will wear out before the sensor breaks. it also means that we’ll have precise sensing for the life of the product. Annoyances include the extra buttons are useless and I think they were put there just for marketing reasons. Gunk tends to build up in the ball supports which requires frequent cleaning. The base doesn’t fit well in my hand – It would have been nicer if the base had been wider or had a slight dip for the base of my hand. 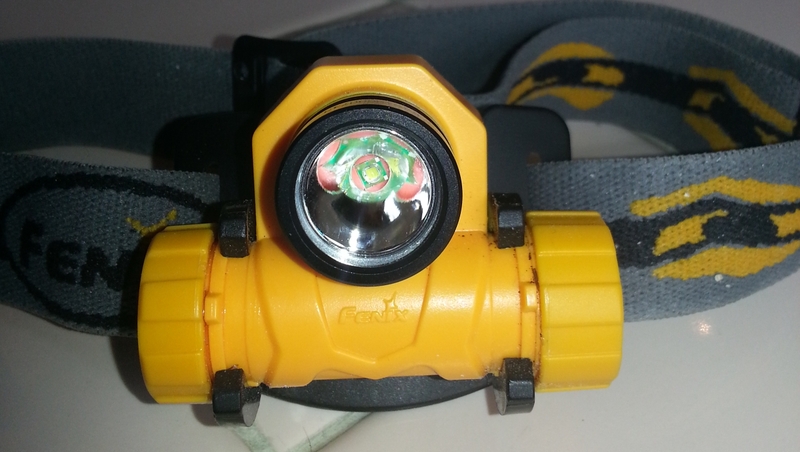 I bought the Fenix-HL21 to light my way during my early morning runs. My reason for choosing it is that the headlamp uses just one battery and the output is regulated so it wouldn’t slowly go dim and fade out. 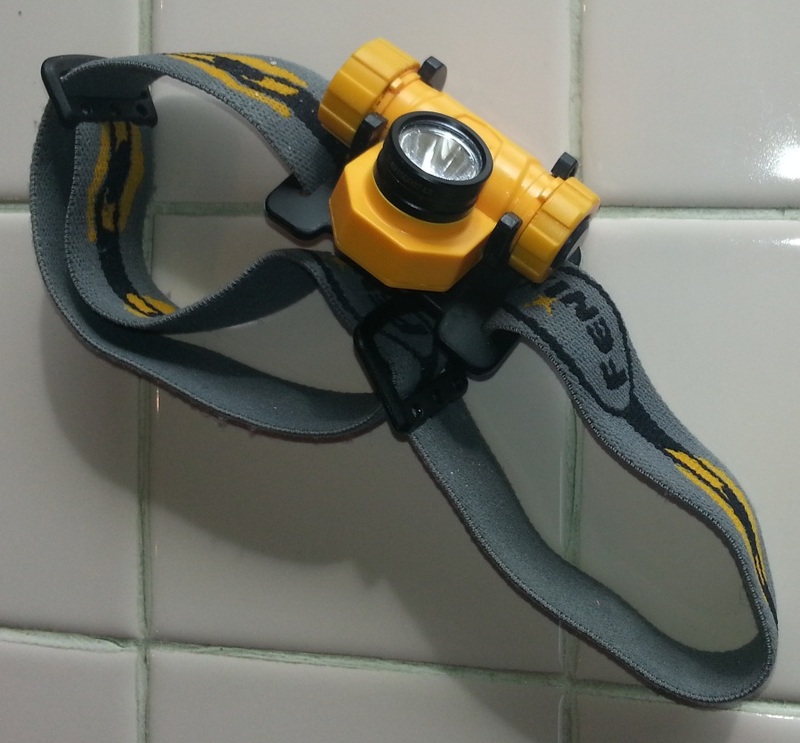 The one battery means that the headlamp is light which means it won’t bounce around when running. 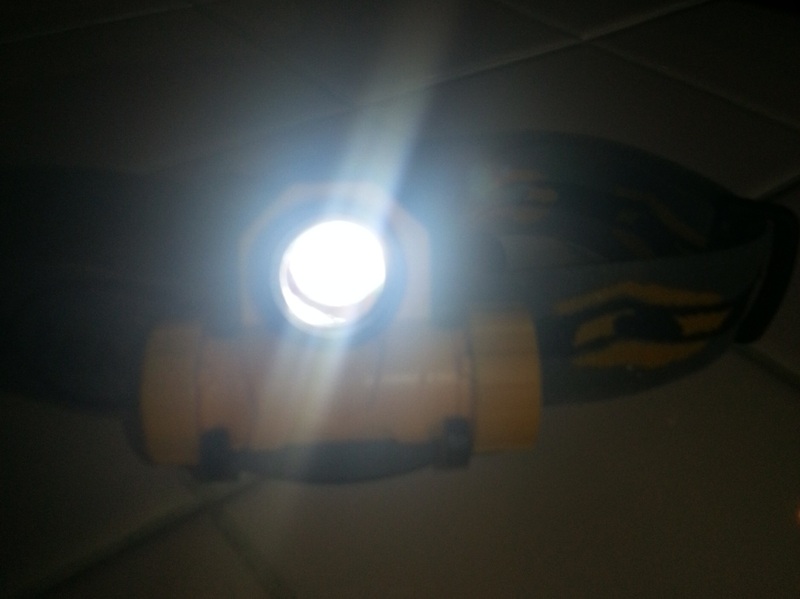 I bought the headlamp in December of 2011 and I’ve now had it for about a year and a half. I use it semi-regularly at night and for general work when I need extra light for a dark space. Overall the lamp is decently but not well built. Unlike other Fenix products which have an aluminum body, the lamp body and battery compartment is made of plastic. The plastic is thick and feels decently rigid in my hand. The casing around the LED is made of aluminum and this is done to facilitate heat dissipation. The cap on the battery compartment has good sized threads which makes it easy to open and close. The plastic construction probably allows the big threads, most aluminum lights have tiny threads that are easy to mis-thread when screwing on the cap. The big annoyance is that the lamp attachment to the headband is not secure and the lamp can come off if you are not careful when handling it. I’ve had issues with my past Fenix lights where the negative terminal spring wears out and no longer makes contact with the battery. It hasn’t happened yet but I fear that it will happen one day. difference between the 43-lumen and 90-lumen settings except that the 90-lumen is slightly brighter. This may be due to the logarithmic nature of our brightness perception. There is very little flood which means there is little light for your peripheral vision which means you’ll be swivelling your head back and forth when you are outside. 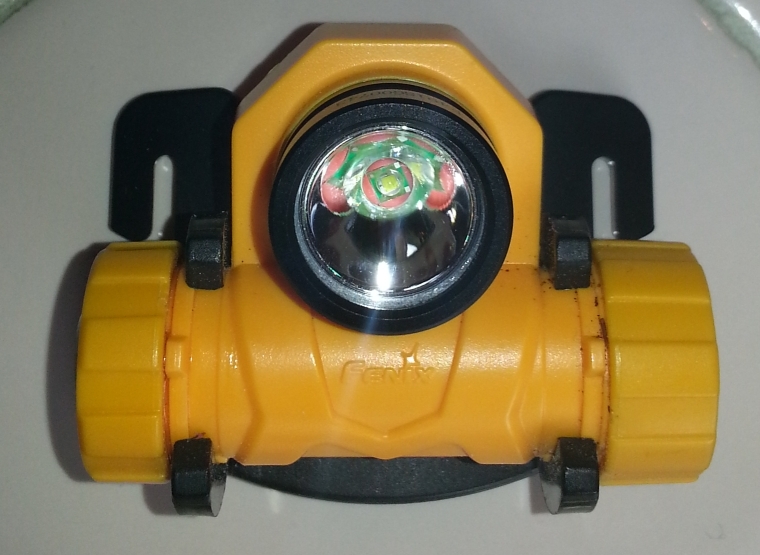 In addition there is a small gap around the cap of the LED which means there is a ring of light that leaks out around the gap. If you don’t adjust the light high enough on your forehead this leakage shines into your eyes which is annoying. Battery life in the HL-21 is decent. It is not great and definitely does not match the product listing, I can expect an Eneloop battery to last about 1 1/2 hours on medium and an hour on high. The light has a tendency to turn off abruptly instead of dimming gradually. This is probably due to the active circuitry used to maintain constant brightness and the non-linear discharge of rechargeable batteries. Low mode is incredible though, I’ve had the lamp stay on for two whole days with juice left over in low mode. that it cuts of circulation to my head. In addition, the area where the lamp attaches to the cord is not padded and it leaves a mark on the forehead. The mark is especially deep when you wear the lamp for long periods and the mark persists for a while afterwards. Imagine going for a run in the morning and then heading to work with a strange red mark on your forehead. 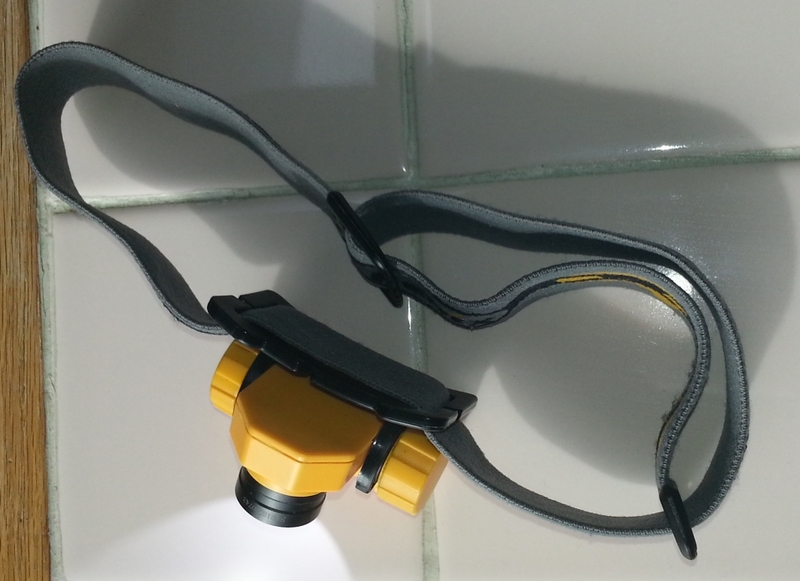 Overall the HL21 is a decent headlamp for its price. it has a couple annoyances that shouldn’t be present at this price point but its worked out well so far.